Don’t know if you’ve noticed, as it’s hard to tell from their website, but in the Fall of 2016, BlueJacket Shipcrafters released a few new ship model kits or, more accurately, boat model kits. 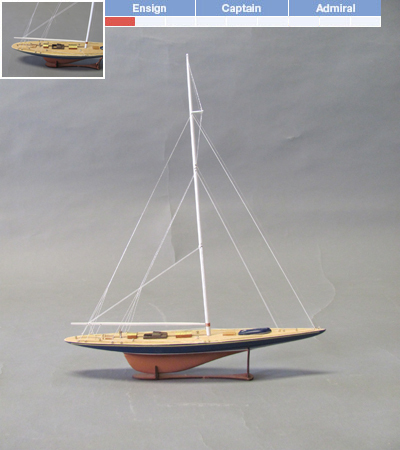 The first two are re-realeases of the miniature models of the America’s cup J-class boats Endeavour and Rainbow. Both are 1:180 scale and measure 8-1/2″ long and list at $89 each. These look like they’d make really nice desk displays. But, you’ll probably want to protect them with the pre-made acrylic cases that BlueJacket sells for them at $95. At the same time, they released a brand new model kit of the sardine carrier Pauline. Some of you may recognize the Pauline as one of the scratchbuild subjects in Harold “Dynamite” Payson’s book Boat Modeling the Easy Way: A Scratch Builder’s Guide, which I believe is still in publication.